1st row: Ralph Haines; Geo Montgomery; Prentiss Baker; 2nd row: Ray Headrick; Wallace Worthington; Bessie Hawke - dec.; Maurice Ranger - Grand Coulee [? ]; Retha Kiser Steiner; Marsa Johnson Hawke; 3rd row: --; --; Arnold Farmer; Norman Reynolds; Ernest Baker; Oren Primm; -- Meyers; --; Alice Zeller; Maron Worthington; --; Martin Johnson - dec.; --; --. Mary A. Bickner. 5th & 6th grades, 1920. Gift of Edith Bickner Brown, 1966. Description Sepia photo. Teacher Mary Bickner and students are listed on the back. Same as photo 3502. Transcription 1st row: Ralph Haines; Geo Montgomery; Prentiss Baker; 2nd row: Ray Headrick; Wallace Worthington; Bessie Hawke - dec.; Maurice Ranger - Grand Coulee [? ]; Retha Kiser Steiner; Marsa Johnson Hawke; 3rd row: --; --; Arnold Farmer; Norman Reynolds; Ernest Baker; Oren Primm; -- Meyers; --; Alice Zeller; Maron Worthington; --; Martin Johnson - dec.; --; --. Mary A. Bickner. 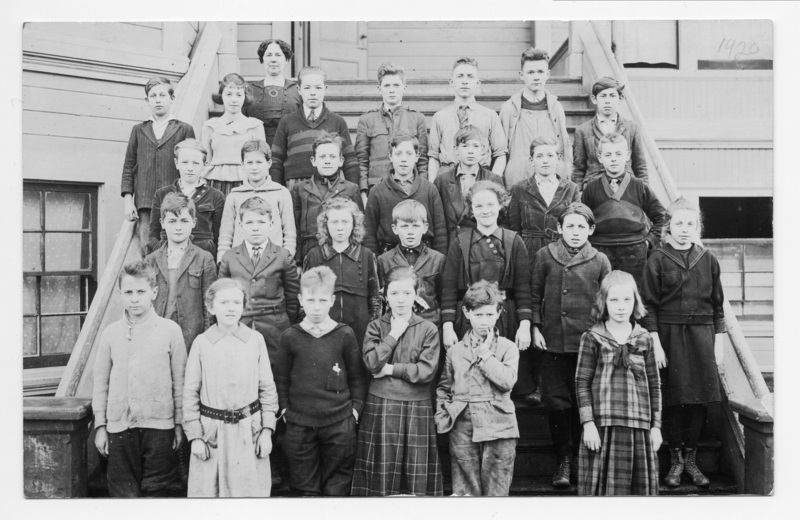 5th & 6th grades, 1920. Gift of Edith Bickner Brown, 1966.